A large and charming map of Ireland mounted on its original linen. Ireland Reduced from the Ordnance Survey Showing All Railways and Stations. 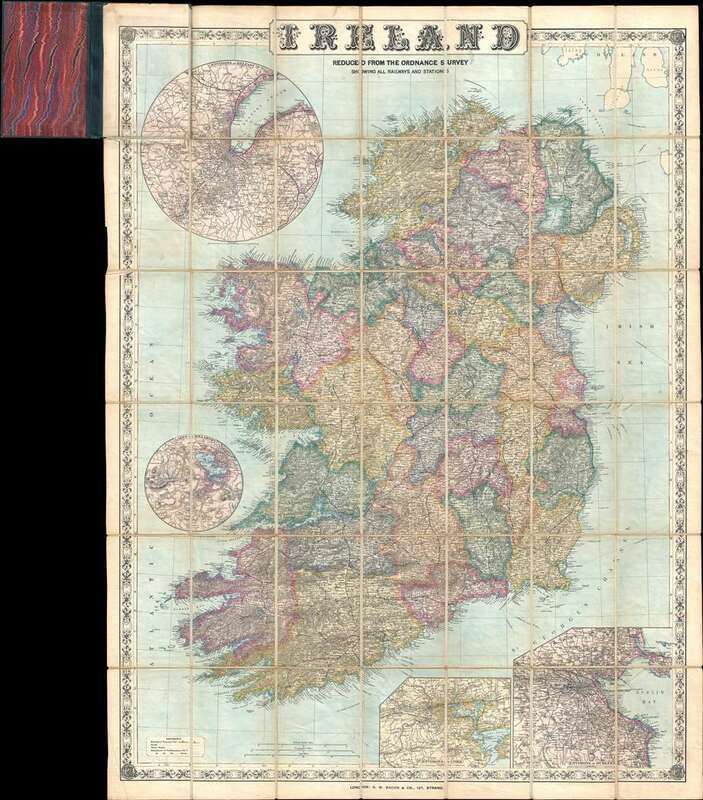 This is a c. 1885 George Washington Bacon pocket map of Ireland. The map depicts the entirety of Ireland from the Atlantic Ocean to the Irish Sea and from Scotland to St. George's Channel. Highly detailed, counties are labeled and shaded different colors to allow for easy differentiation. Myriad cities, towns, and villages are labeled, including Dublin, Belfast, Londonderry, and Cork. Roads are illustrated throughout, and the rail network is shown by black and white dashed lines. International steamship routes are also noted, including the route from Londonderry to New York City. A key, situated in the lower left corner, explains all these notations. Four inset maps highlight different areas around Ireland. Two, located in the lower right corner, focus on the environs of Cork and the environs of Dublin, respectively. The Lakes of Killarney are illustrated in a circular inset situated in the Atlantic off the coast of County Clare, and finally a circular inset featuring the environs of Belfast is included in the upper left corner. The whole is surrounded by a charming border decorated with clover. This map was published by George Washington Bacon and Company c. 1885. Very good. Dissected and mounted on linen in 42 panels. Light wear along original folds. Attached to original binder. Blank on verso.